Respirometer chamber for oxygen consumption measurements in inactive / resting (not swimming) fish and aquatic invertebrates. Use the respirometers with your own oxygen and data acquisition equipment or with our systems for automatic respirometry. For oxygen consumption measurements we made a basic medium chamber system including the minimum equipment required. A single end cap for a medium horizontal chamber. 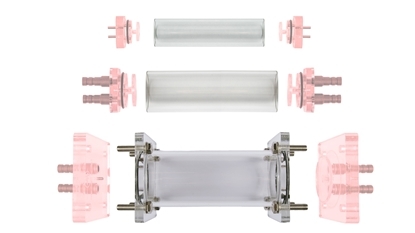 Use two of these end caps and a replacement tube to build a complete chamber. 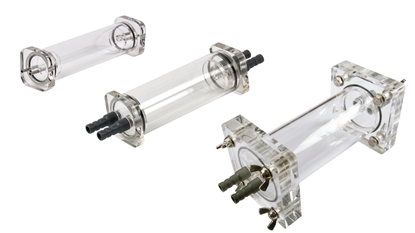 With this replacement tube you can build a deeper or more shallow respirometer chamber using an end cap from a complete chamber with similar inner diameter (ID). A single end cap for a medium vertical chamber. Use one end cap and a replacement tube to build a complete chamber.